Celebrating getting this done before I go into my afternoon happenings and my evening course. Hope you have enjoyable moments this Monday! Well, Monday zipped on by. 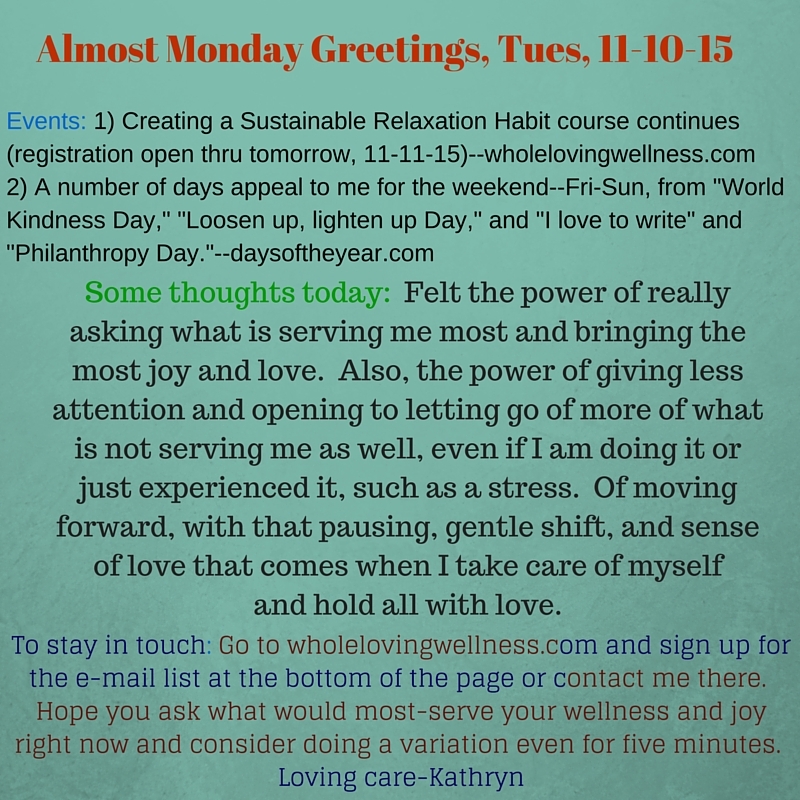 Had my relaxation course class 1 and an enjoyable day and then Tuesday came and I realized, no Monday Greetings came yesterday…..so, here they are a day late :). I also included a few new pictures I took from last week of roses in the snow. They will be up on bloomsofwonder.com soon. Hi all! Going to at least put the one onto my website before my p.m. Creating a Sustainable Relaxation Habit begins in a little bit here. Please note the free call about Whole Loving Wellness this Weds if you’d like to be there. Thanks! Hi all! Glad to greet you this Tuesday! I would very much enjoy your feedback about the Monday Greetings lately, including the formatting to post. I’m thinking this is easier than making a download, but, not sure. Also, want to highlight that tomorrow (Weds 11-11-15) is the last day to register for “Creating a Sustainable Relaxation Habit,” the course we started yesterday. We are just starting to develop habits and then we’ll adjust them over the next couple of classes and delve into making them “stick.” So, please get in touch with me if you’d like to join in. More soon, hopefully on Monday if not before :). Here are the Monday Greetings this November 2nd. Looking forward to the two free calls this Wednesday, to sharing the recordings and possibly some notes and then to the course starting next Monday and the experiences from the course!